Treasure! The vaults of museums around the world are filled with precious antiquities, but who knows how many historical gems are still out there waiting to be unearthed? This list shows, that anyone can strike it lucky… even you. So grab your metal detector and get searching. Advanced modern technology and availability of equipment made it possible for metal detecting hobbyists to find bulk of significant treasure. We would like to present you with 6 most significant UK finds of the past fifty years 5 of which were found with metal detectors. Ringlemere Cup was only the second specimen of its type found Britain. The first gold cup was discovered in 1837. These gold containers date from the very early Bronze Age (2300 BC – 4000 years ago). They are comperable to examples discovered around the Mediterranean, indicating relation between the Cornish and Greek. The cup was purchased from Mr Bradshaw by the British Museum for £270,000. Workers digging on a building site accidentally uncovered the largest hoard of medieval coins ever found in Britain. This astonishing cache dates from the 15th century. It included 1,237 gold coins, four rings, four specimens of jewellery, and two pieces of gold chain. The hoard was probably buried in haste at some time between winter 1463 and summer 1464, perhaps by someone fleeing south after the Battle of Hexham in May 1464, in the first stages of England’s civil war between aristocratic factions, the War of the Roses. The heart-shaped brooch is engraved with the phrase “je suys vostre sans de partier” (I am yours wholly). 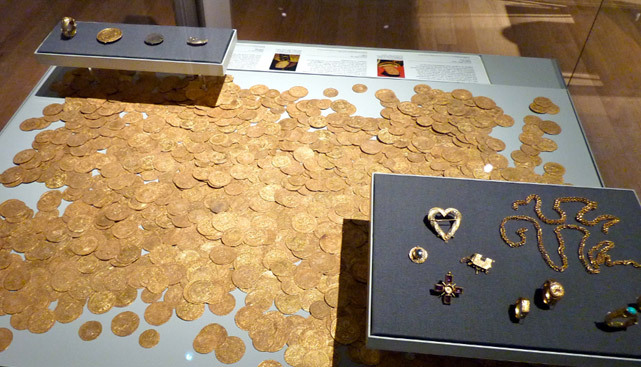 Hoard was purchased by the British Museum for around £300,000. Mr Crisp was hoping to find a coin or two during that detecting expedition. What he discovered exceeded all his expectations. The Frome Hoard is a collection of 52,503 Roman coins. 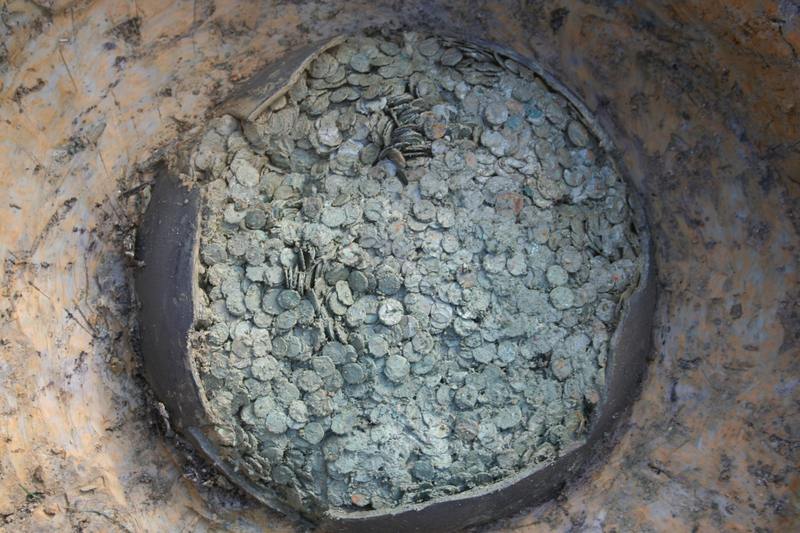 The coins were contained in a ceramic pot 45 cm in diameter, and date from AD 253 to 305. Most of the coins are made from debased silver or bronze. The hoard is one of the largest ever found in Britain. It contains the largest group of coins issued during the reign of Carausius, ever found. Carausius ruled Britain independently from 286 to 293 was the first Roman emperor to strike coins. Silverdale Hoard found in Harrogate, North Yorkshire in 2007 metal detecting hobbyist David Whelan and his son Andrew. After 20 minutes of detecting in a field that Mr Whelan had previously searched several times before without finding anything more significant than a Tudor half-groat, he got a signal. Buried about 16 inches deposited together in and under a lead container there was a Viking treasure dated around 900AD. 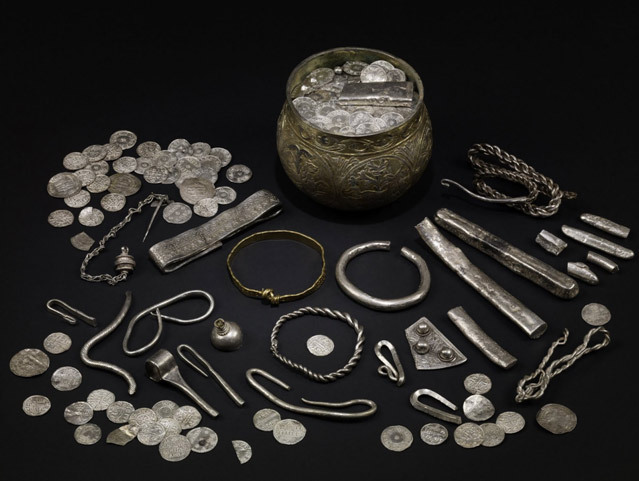 The hoard consists of a variety of silver items including 27 coins, 10 arm-rings, 2 finger-rings, 14 ingots, 6 broach fragments, a fine wire braid and 141 fragments of arm-rings and ingots which had been chopped up and turned into hack silver, which was used as a form of currency in Viking times. Together they weigh a little over two pounds (1 kg). The hoard includes Arabic, Anglo-Saxon, Anglo-Viking and Viking coins. They date to around AD 900 and include coins of Alfred the Great and the Danish-ruled Kingdom of Northumbria. Hoxne Hoard found in Hoxne, Suffolk in 1992 by Peter Whatling and Eric Lawes while searching for the lost hammer. The Hoxne hoard consists of over 15,000 gold and silver coins, gold jewellery and numerous small items of silver tableware, including pepper pots, ladles and spoons. Also found were traces of a large wooden chest and smaller caskets with tiny silver padlocks, into which the treasure had been carefully secreted. Hoxone Hoard is Roman Britain, buried in the 5th century AD. 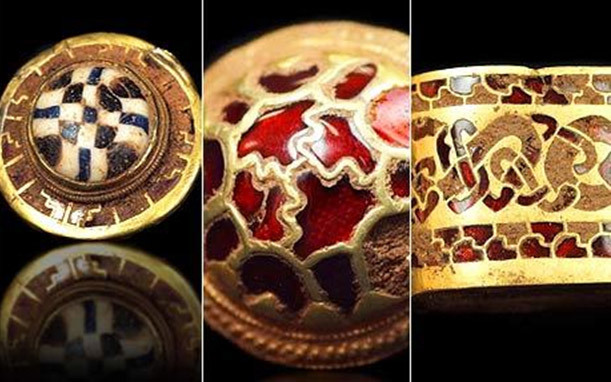 The Staffordshire Hoard is the largest hoard of Anglo-Saxon gold and silver metalwork yet found. It consists of over 3,500 items comprising up to 5kg of gold and 1.3kg of silver. Items are nearly all martial in character and there are no objects specific to female uses. The artefacts have tentatively been dated to the 7th or 8th centuries, placing the origin of the items in the time of the Anglo-Saxon kingdom of Mercia. Now take your detectors head off to the country and find that magnificent treasure. We wish you good luck. Maybe next story will be about you.